Ryte is a great best practice example of well-thought out job ads. First, they included icons that highlight their employer benefits in an eye-catching way. Then they used a CTA with a more emotional message (“Yay! That’s my thing.”) that’s sure to stand out from typical job ad CTA’s (like “Apply Now"). They’ve also made sure their talent network sign-up form was displayed prominently and even included it twice. And at the bottom of the page they included further job opening suggestions. Mister Spex covers all the bases with their job ad, starting with an emphasis on their employer benefits via icons. They also include specific instructions about the documents needed to apply, as well as instructions on how to apply. They even go as far as including a name and photo of the relevant contact person that the applicant can expect to hear from. 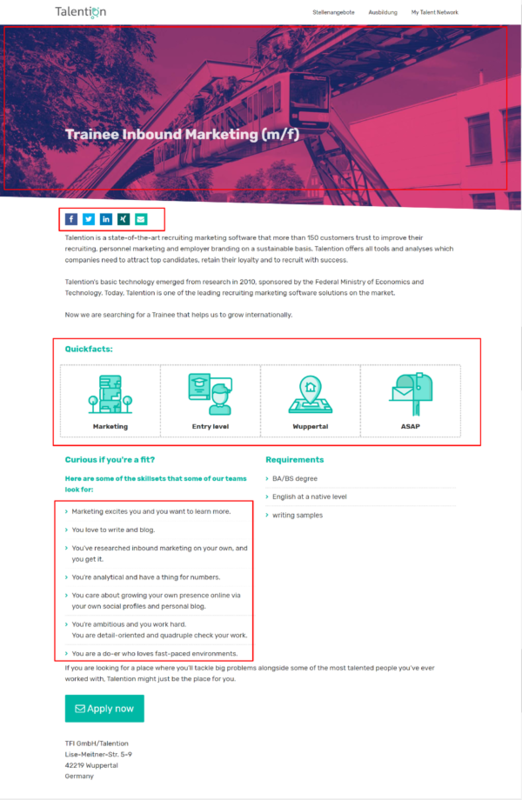 At the bottom of the page they include their social media accounts so that applicants can follow them and learn more about their company culture. VOK DAMS is one of the leading agencies for events and live marketing. 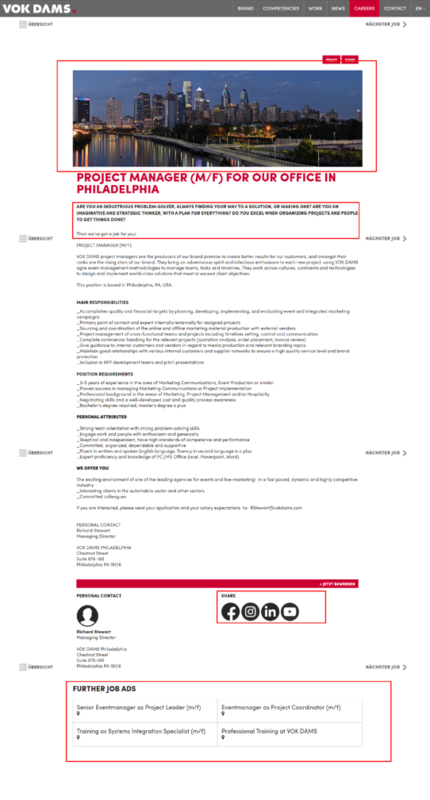 They start off some of their US job ads with a photo of the Philadelphia skyline, because one of their international offices is located in Philly. This is the perfect way to catch the attention of candidates living in or around that location. Next, they have written an attention grabbing opening paragraph, one that certainly stands out as unique. They’ve included social media accounts, as a way for candidates to share the job ads on their own accounts. In case this job ad does not catch the attention of the candidate, they’ve included more open positions at the bottom of the ad. We’ve put a lot of effort into perfecting our own job ads. First off, we use an image from Wuppertal, the city where our office is located, as a way to reach our target group of local job-seekers. Then, we've included sharing icons to allow applicants to share the position online. Next, we've highlighted some important facts about the position through eye-catching icons. For the main tasks of the position, we've broken down the points into easy to read bullet points and used emotive language. 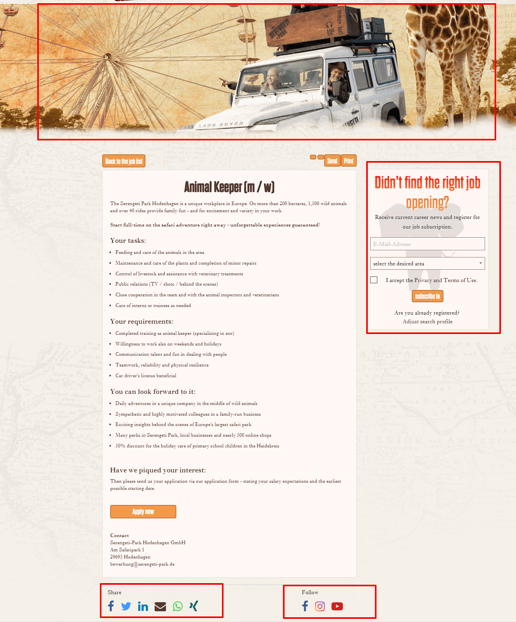 This job ad from Serengeti Park does a great job of incorporating employer branding into the page. The header is a clear representation of their brand. In addition, they've highlighted their talent pool sign-up form on the right of the ad. At the bottom of the page, they've included social sharing icons. They've separated them in two categories, share and follow, to encourage applicants to both share the job ad and also to follow their own accounts. Would you like to see more specific job advertisement examples from your industry? We will gladly show you further best practice examples and concrete implementation in the Talention software. Just ask for a demo here and someone will get in touch with you shortly. Request a demo now.